An advocate makes the case for the promise of stem cell research, arguing for further funding. After his son was paralyzed in a college football game, Reed (The Kraken, 1997, etc.) 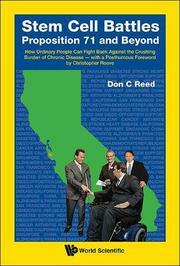 helped organize California’s Proposition 71 campaign to create a state fund of $3 billion to boost stem cell research. Teaming up with politicians, fundraisers, and other supporters to gather more than a million signatures, he helped the initiative win a solid victory on the ballot in 2004 after a bitter fight. Opposition came mainly from Christian conservatives and the Roman Catholic Church objecting to the use of embryonic stem cells. Reed describes the science of stem cells and the heart of the debate over “personhood,” or the definition of when life actually begins. Because embryonic stem cells are harvested at in vitro fertilization clinics rather than from women’s bodies and hold the promise of saving the lives of the chronically ill and disabled, utilizing them actually represents a “true pro-life position,” he argues. Elsewhere Reed describes meetings of organizations seeking to advance stem cell research and profiles victims of disabilities and diseases whom research might help: those coping with diabetes, Parkinson’s disease, and Lou Gehrig’s disease, among many others. One day stem cells might even help repair or grow organs such as the heart and liver. Other chapters and appendices include interviews with stem cell scientists and advocates in the United States and around the world. Reed has hit his target with a shotgun approach to the complicated and emotional stem cell debate. His main strength lies in his ability to translate complex scientific studies into conversational prose. He personalizes the science with heartbreaking personal accounts of the suffering of victims, including his own son, who could benefit from stem cell breakthroughs. Sometimes, however, Reed gives too much detail about himself and his family. And he’s such a strong booster of stem cell research that some readers may suspect he underplays its limitations. Although his argument that investing in stem cell studies will save taxpayers money is perhaps debatable, most readers should agree that such research will almost certainly pay off one day in reduced human suffering. Despite a few drawbacks, this solid primer should be useful to anyone interested in stem cells and their potential to change the world.